This variation of the standard kettlebell deadlift makes it a little trickier due to balancing requirements. You should absolutely have the regular deadlift mastered before attempting this kettlebell exercise. For people who are trying to lose weight, it may be difficult to maintain perfect balance while completing a set. The exercise starts off very much like the standard deadlift. Using both hands to hold the kettlebell by the handle, make certain you are standing straight up and arms extended downward. Lean forward hinging at the hips to push the bell towards the ground. As you do so, simultaneously raise one leg completely outstretched. 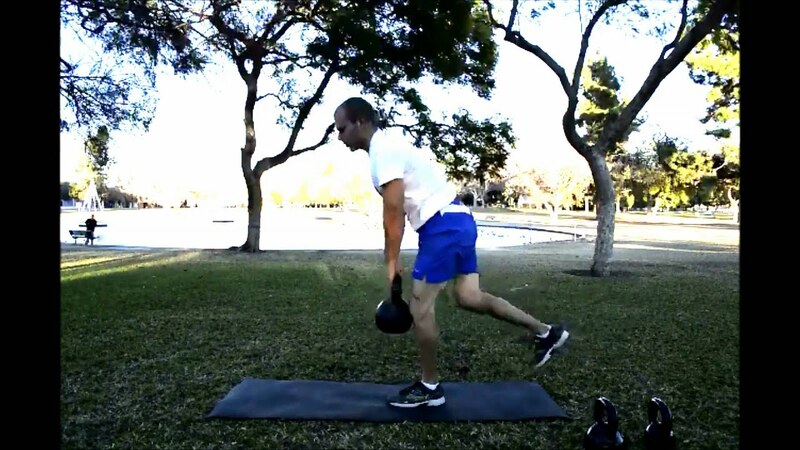 Once the kettlebell touches the floor your leg and back should be nearly level with one another. Then it is just a matter of reversing the motion to return to a standing position to complete the rep.
It’s not easy, but do your best to ensure that when your leg returns downward that it is still lifted off the ground in the upright position. You’ll want to shoot for 8 reps to complete 1 set. It is suggested to do 2 sets, one for each leg. Other 1 leg deadlift exercises may have you use one hand to hold the kettlebell. If you feel comfortable doing so then that is fine, but we think the two-handed method offers the most benefits for your muscles.